Opera singers are asked to impersonate animals more often than you might imagine – think of the feisty heroine of Janáček’s The Cunning Little Vixen, the dragon and Woodbird in Wagner’s Siegfried or the array of creatures in Ravel’s L’Enfant et les sortilèges. But real-life animals sometimes get their chance to star too. 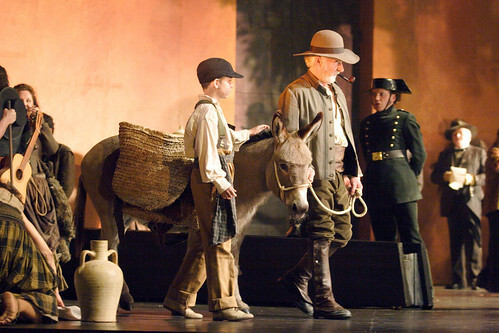 Francesca Zambello's production of Carmen, which opens on 16 December, offers an animal acting bonanza, including parts for a clutch of chickens and the patient donkey Pollyanne (who also starred with Plácido Domingo in Pagliacci, where she tried a little karaoke!). 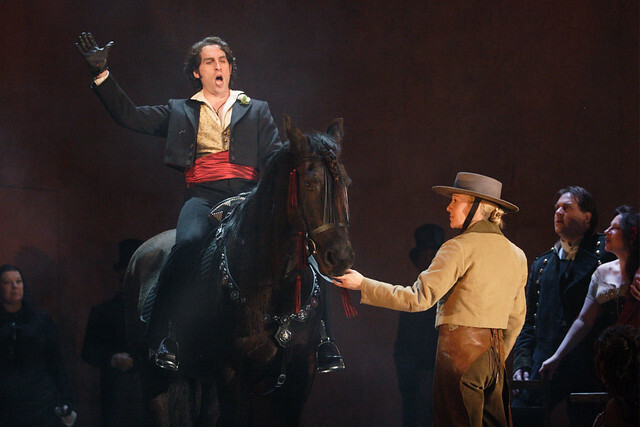 But the best dramatic role goes to Louis, Escamillo's majestic black horse in Act II. Louis created the role in 2006 and has appeared in each revival; with the help of a few polo mints he even seems to enjoy the singing. 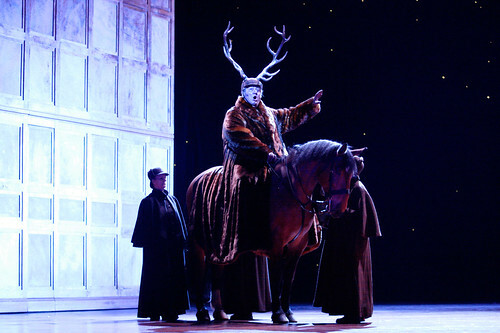 There's plenty of horsing around in both ballet and opera at the Royal Opera House, from the cob horses in Trevor Nunn's production of Kát’a Kabanová to the white Shetland pony Peregrine and his dainty cart in La Fille mal gardée. 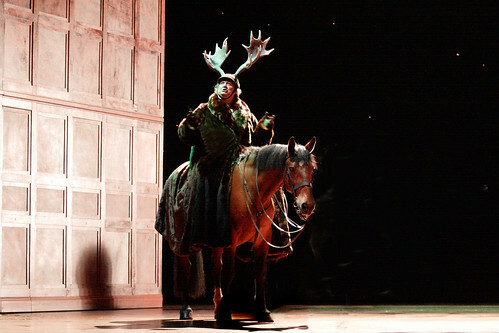 In 2012 a 15-year-old Irish draft horse named Rupert made national news in Robert Carsen's new production of Falstaff. 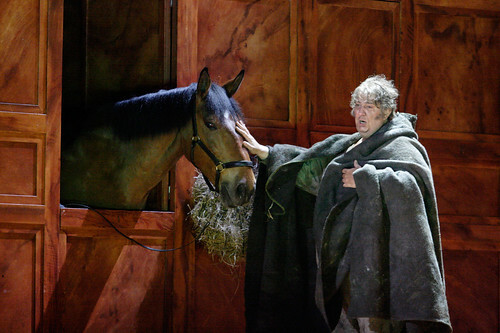 Rupert had instant star quality, offering silent sympathy to Ambrogio Maestri (Falstaff) while munching on hay in Act III scene 1, and letting Maestri ride him round the stage in Act III scene 2. Maestri, a novice rider, described their relationship as ‘love at first sight’. Dogs are also notorious for their love of performing, and several Royal Opera productions have included parts for pooches. The Visconti production of Don Carlo equipped Philip II with two wolfhounds (though they had to be retired after one joined in the singing). 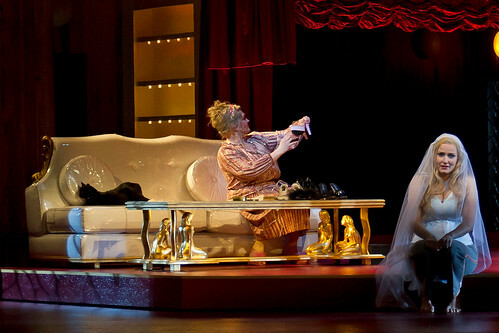 Count Almaviva in David McVicar’s production of Le nozze di Figaro shows his animal-loving side when he leads on a springer spaniel in Act II. So does Musetta in John Copley’s beloved production of La bohème; she makes her striking first entrance with Puffin, a fluffy white German spitz endowed with saint-like patience. Alfie, the village dog in L’elisir d’amore has an even more challenging role, with two massive sprints across the stage in Act I. This young Jack Russell terrier stole the show in 2012, and even elbowed his way onto the website. Cats are a little less stage-savvy than dogs, and we sometimes have to rely on model moggies – like the sleeping cat in Moshe Leiser and Patrice Caurier's production of Il turco in Italia. However, the real black cat Girlie bravely endured a full five minutes as the witch Ježibaba’s cat in Act III of Jossie Wieler and Sergio Morabito's production of Rusalka, curled up on a sofa and seemingly impervious to the noise of several opera singers and a ninety-piece orchestra going at full pelt (as it were). Birds have also had the odd walk-on part. Sadly, the eagle scheduled to appear in Graham Vick's production of Mitridate, re di Ponto got bored in rehearsals and so his contract had to be terminated, but in David McVicar's Die Zauberflöte Sarastro's majesty is enhanced by a handsome and very well-behaved falcon carried on by an attendant priest. ‘Never work with children or animals’, the saying goes. But our experiences at the Royal Opera House contradict it. Our animals perform before more than 2,000 people, cope with often very loud music and behave impeccably. They are indisputably stars. 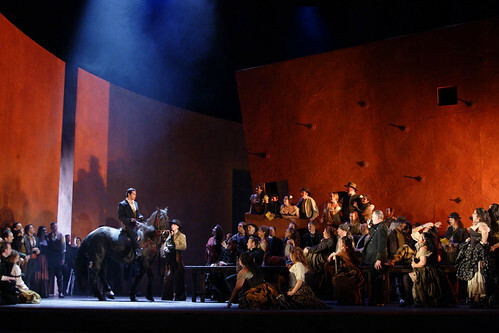 Francesca Zambello's production of Carmen runs from 16 December to 9 January. Tickets are available now. I have seen Louis a number of times in Carmen and he is magnificent! As an equestrian I am constantly impressed by the stoicism and poise of animal performers- thanks for highlighting them! My very favourite was Henry, the springer spaniel, in Nozze. He was a true star and clearly loved his 10 seconds of glory! Peregrine, the Shetland pony in La Fille was also a star, particularly when he crapped on stage forcing one of the dancers to clean up after him. That poor cat in Ruslka, on the other hand, was clearly most uncomfortable and seeing him there really upset me. Cats are not suited to this kind of thing! In their place, they're fine. But was I really meant to be watching Rupert rather than Ambrogio Maestri during "Mondo laddro"? I haven't a clue how he sung it but Rupert was gorgeous. 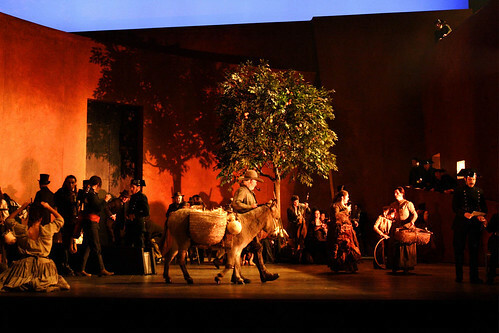 Maestri was really generous to surrender his great scene to the horse. Two pigeons in the Ballet the Two Pigeons were exemplary when I saw it. As for Peregrine the naughty little pony in La Fille mal Gardee, he is just adorable and he looked great munching his way through his 'bouquet'!